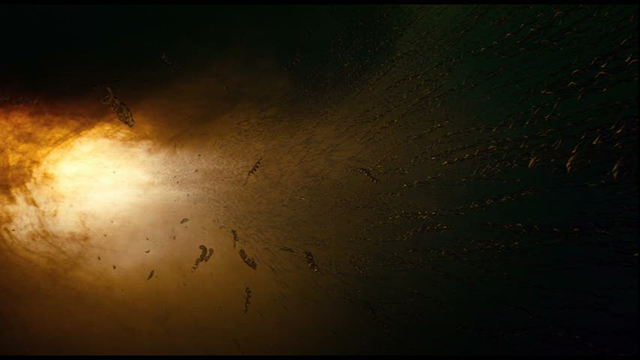 it's been suggested that the tree of life may be a film made for cinephiles, but i think this sells both the film and the audience short. like 2001: a space odyssey, it's a film that contains experimental elements, a philosophical stance, and a story providing a framework for answering the really big questions. it's exciting to see a mainstream big budget film depart from conventional ways of storytelling and ask the audience to to take a leap into abstraction. these moments of abstraction- exploding super novas, the origin of life, our primitive world and it's natural processes seemed to push the depth of the narrative. the core of the story- a family melodrama is fairly conventional. the way in which this story unfolds is not. when we step outside the story into the universe we learn that the idea of grief is as old as time and only something massive like the universe and time itself can begin to quantify the feelings of loss and rage in the face of death. the dinosaur tableau in particular is a divisive moment in the film. audiences seem particularly polarized by it's relevance. i found myself thinking that in a post jurassic park world, computer generated dinosaurs are expected to be hyper realistic. perhaps the shortcoming here was that these particular dinosaurs were not and thus functioned on the level of distanciation, pulling us out of this fantastic world and into the banal one of computer “wizardry.” nevertheless the moment is still relevant as a symbol of the father. we learn that the need to dominate is ancient and pervasive. it is not specific to man- it's nature vs. grace. the complexity of the family unit, the roles both children and parents play in both it's cohesiveness and the way in which it can shatter apart is what really spoke to me about this film. the story of families, how we celebrate, grow and suffer together is dynamic. it is more often a push pull dance between the parts than the force one single person exerts upon it. the family is not just the kernal from which all life springs but also a reflection of the world we inhabit, putting us on a continuing trajectory of suffering, grief, joy and love.